A new cellphone is a joy to have, at least till the time you get tired of it, which normally happens within six months. So I decided to change my old Android running gadget for a new Android running gizmo. The choices were plenty in fact a little more than plenty, enough to confuse a grown up man with greying hair. The prices varied form a few thousand to almost many thousand. The specs would confuse NASA, and the looks would entice even the introvert and make him feel like an extrovert, but for a little while. Wallet loaded with cash, credit cards lined up in order and with a cellphone in mind I went to a huge store that specializes in confusing people with its variety of cellphones on display. The eyes were trained for looks, the heart on a looker and the mind on saving some dough. Lo and Behold I settled for a mid category (a term used by the salesgirl) Android that could, she told me, do almost anything! That alone stirred up my imagination more than anything else ever did! So I took the phone while the lady swiped the card and handed me the device. Being the impatient crooner that I am, the new phone was unboxed, SIM loaded and the gadget powered up. Lights flashed, music blared, ringtones jingled and I felt happier than ever. The mall was huge, she shopped for things she did not need, kids eyed things they wanted to buy since ages and I settled for a Cola. After 2 hours, 10 minutes and 33 seconds she gave me a call and asked for food. Taking the kids along we covered distance in seconds and hit the food court. There were at least 13 shops selling food items from Pizzas to Burgers, Chinese, Turkish and what not. All 5 members of the family wanted something different. After a round table conference, much bickering, some cajoling and finally some threatening the menu was decided, the bills paid we had our meal. Ice cream was next, but not for me. Not because I don’t love it, but that’s when nature decided to call. The new cellphone which was a mere two hours old rested snugly in my shirt pocket while I rushed to do the dirty business. The defecation went smooth as the pressure was intense. After the dirty business I got up from the toilet seat, flushed the contents to their eternal journey and was about to pull my pants up when I heard a small thud and certain blop. 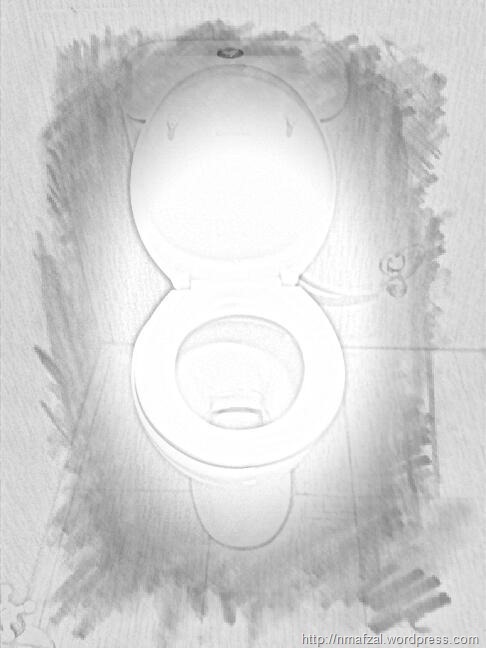 Looked around, only to find my new cellphone in a state of bliss in the commode. Holy s……! Oooh Aaah, damn @%#$$$. She smiled at me, as if blinking. The lights faded then brightened at least three times before slowly turning off completely. I stood there a complete 5 minutes, not sure what to do. With one small gesture I flushed once more, washed my hands and had one last look at her. She wasn’t there anymore. She had departed on a eternal journey with the stuff.